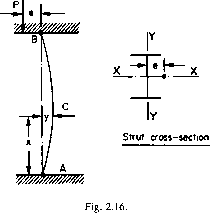 Determine the maximum compressive stress set up in a 200 mm x 60 mm I-section girder carrying a load of 100 kN with an eccentricity of 6 mm from the critical axis of the section (see Fig. 2.16). Assume that the ends of the strut are pin-jointed and that the overall length is 4 m.
Take Iyy = 3 x KT6 m4, A = 6 x 10-3 m2, E — 207 GN/m2.